Editor’s Note: We surveyed growth practitioners from top companies like Nest, SurveyMonkey, Affirm, NerdWallet and others to find out what they’re reading to stay current with the latest in growth and tech. You’ll find their list of favorite content sources at the bottom of the post. What do YOU like to read -- that we might be missing? Tweet @reforge to let us know! 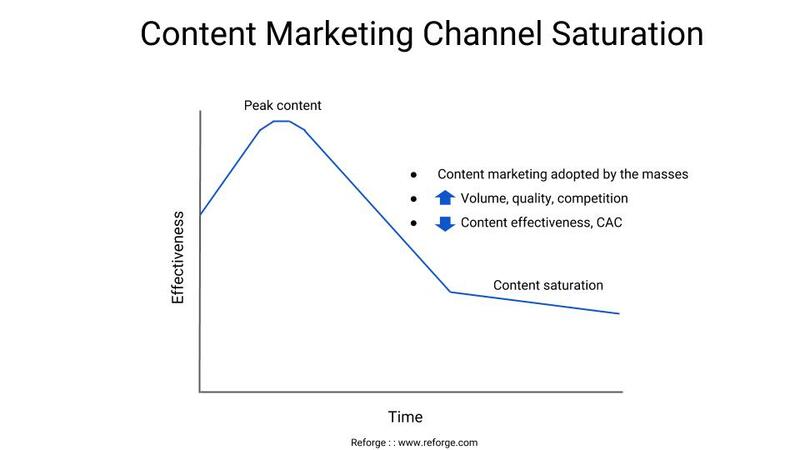 While content is getting better, its reach is decreasing, CAC is increasing (faster than CAC for paid marketing), and competition is skyrocketing. ProfitWell recently published a study revealing some grim statistics that illustrate these points - compared to 5 years ago, 300% more content is being published per month, posts are almost 100% longer in word count, and shares per post have dropped 90%(!) in the last 2 years. The textbook symptoms of channel saturation have set in. Here at Reforge, we realized if we didn’t adapt, we’d risk getting left behind. But how do you adapt when channel saturation takes over? We started answering this question (it’s a work in progress) by going back to basics and talking to our target audience to drive insights. Our goal was to understand how our audience chooses which content to consume, and which to tune out, and to make sure our content doesn’t end up in the “tune out” pile. In this post, I’ll share what I learned from our research. We are a small team that prioritizes moving quickly so the research process was both simple and scrappy. I conducted in-depth user interviews with seven people from our target audience (growth practitioners, product managers, marketers, and data scientists), posted questions to our discussion forum for Reforge growth program participants and alums, and conducted a 2 question survey. Let’s walk through each in a bit more detail below. Scanning content for relevance stood out as one of the critical “coping mechanisms” people have developed to deal with the onslaught of high quality content. This means the title, subheadings, and format of your piece are the gatekeepers to your audience’s attention. Use them to expose the value of the piece without giving away too much. Your title and subheadings must invite curiosity so your readers want to dig in, and the format must make the piece easily scannable for the high level takeaways. Be thoughtful about how you use spacing, bullets, numbered lists, the bolding of key concepts, and images to construct a compelling narrative. Is this highly relevant to the problem I’m trying to solve, or topic I want to learn about? How long will it take me to consume this? Do I have time for it now? Or do I need to bookmark it for later? 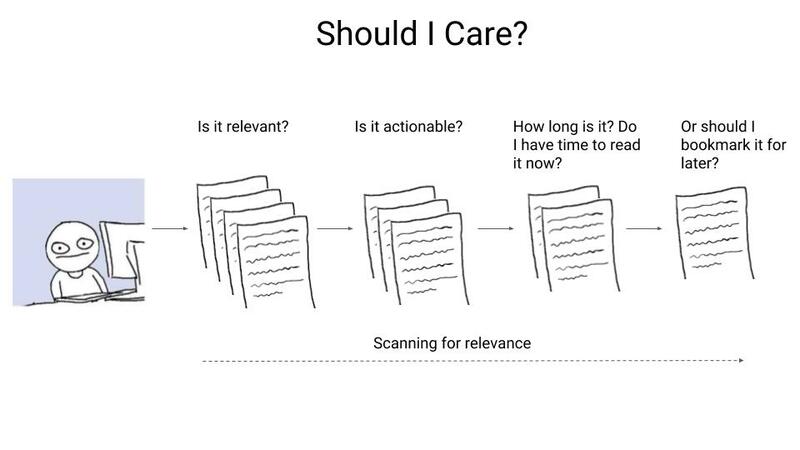 Keep in mind that the process someone will go through to assess your content for relevance will likely differ if your content is created to entertain, rather than educate. A curious pattern emerged during my research - podcasts and books were often the first thing people mentioned when I asked them to share their favorite content on any topic (not just growth). In a world trending towards instant gratification, I expected people to list content that delivers easily digestible summaries of complex topics - think theSkimm. So, what put books and podcasts at the top of the list for our particular audience? Anyone with an idea, access to a CMS, and social media can “pump out” and distribute a long form blog post in 10-20 hours. If people like it, it will likely even get some free distribution via sharing. Conversely, book ideas must first be pitched to and picked up by a book publisher. Then, it takes 1-3 years and tens (or hundreds) of thousands of dollars to produce and distribute the book. Similarly, if you’ve ever tried to produce and distribute a quality podcast, you know it is no small investment of resources. We all know that the ROI of content marketing is often harder to track than that of other forms of acquisition, like paid marketing. This is especially true for books and podcasts, which generally drive brand and awareness, rather than lead generation. These time, cost, and ROI burdens force anyone thinking about publishing a book or podcast to be more discerning, and serve as built in quality enforcers. Audio content - predominantly podcasts and audiobooks - boast a key advantage that no other type of content can compete with - it can be easily consumed while doing other things, like commuting, housework, exercising and more. Because it indexes high on both usability and depth of quality, when people listen to learning focused audio content, they listen a lot - the members of our small sample who consume content via audio tend to listen 4-5 hours per week on average! The hands free, screen free nature of this favored content format, coupled with the insight on scannability above, just go to show that UX can be make or break, not only in the product world, but in the content world as well. This is where dark social comes into the picture. Dark social is targeted one-to-one content sharing via various messaging apps - text, Slack, Whatsapp, and Messenger, for example. It is challenging to track and, therefore, ends up getting labeled as Direct traffic in Google Analytics. Dark social is the antidote to the noise caused by broadcast sharing and accounts for 80+% of outbound sharing. For insights on how to measure dark traffic and what it implies about virality, read Susan Su’s Thoughts on Growth newsletter. Too often I’ve heard people talk the talk of doing user research, but when put under the pressure of aggressive OKRs and tight deadlines, they fail to walk the walk. They’re in such a rush to get to market or run those growth experiments, they skip the foundational step of talking to their customers. Each audience is different, each product is different, and each company is different, so don’t automatically assume that the insights pulled from our Reforge audience will apply to your audience. If you take nothing else away from this post, I hope it inspires you to gather the qualitative and quantitative data you need to adapt to the shifting content marketing landscape. Below is the recommended reading list that resulted. What do YOU like to read -- that we might be missing? Tweet @reforge to let us know!